All Handmade Art/Crafts by...Artist Mary Gonzalez at MJ Crafts Design Studio: MJ Crafts Design Studio--Home of Handmade Crafts and Eggypieces--is MOVING!!! MJ Crafts Design Studio--Home of Handmade Crafts and Eggypieces--is MOVING!!! 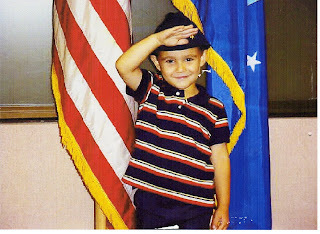 My son Antonio Jose at the Retired Ceremony, March 1st, 2005. 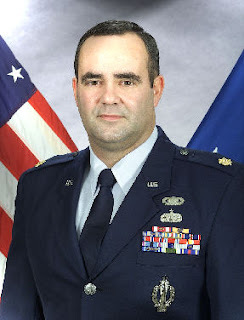 Major Jose A. Gonzalez, proud American! Well....it had to happen. After 24 years of service in the great United States Air Force, it has come my time to be honorably discharged and join the ranks of the "Retired." My wife (Mary) is unable to continue creating her wonderful handmade crafts and handcrafted gifts during this transition; therefore, MJ Crafts Design Studio has temporarily halted its operations to allow for the packing and transportation of our household goods from South America back to the United States. We expect to be unpacked, settled, and ready to resume operations by late March. I guess that now, as a retiree, I can finally now go to the Base Exchange and buy me one of those "USAF Retired" baseball caps which I remember seeing veterans wear around the base. It is a time of mixed feelings...sadness in that I may not again wear a uniform I'm so proud of...but happiness at the prospect of a whole new career and a new chapter in our life. The world has evolved considerably in those 24 years. Back then, when I started as a Missile Launch Officer, underground in a Launch Control Center in Missouri, the main enemy was the Soviet Union... with its tanks and huge army. Our Intercontinental Ballistic Missiles were pointing at them, and theirs were pointing at us. Nowadays things have changed, as we are fighting an enemy who hides amongst civilians and uses churches and hospitals to shoot from. Well, I don't want to get on a soapbox and discuss the current state of world affairs. Let's better focus on beautiful and positive things...such as a baby, a friendly smile, a butterfly kiss from a daughter, a nice walk on the beach, funny handmade crafts, etc. So...remember to look us up again in late March. We will post a message once we are back in business. Once we are back in the states, our shipping and payment options will increase, therefore improving our customer service considerably. Looking forward to continue to serve you. I'm sure Mary will spend a lot of this "down" time making sketches and coming up with more ideas for future collections. For now, these are Mary and Jose, and MJ Crafts Design Studio, ...signing off temporarily......CIAO! See you soon! All Handmade Crafts, Decorated Eggs Art Gallery & Handcrafted Gifts Collectibles - MJ Crafts Design Studio features the Eggypiece Art Collection, beautiful and funny FIMO Polymer Clay creations, and many more 100% handmade crafts made out of ceramics, porcelain, wire, beads, and polymer clay. Very unusual! PayPal and Family Friendly. Come and Visit Us!